Since most dinosaur names consist of long, polysyllabic gargles—Parasaurolophus, Therizinosaurus, Pachycephalosaurus—it is refreshing that the latest addition to the family has the shortest one yet. In full, it is Yi qi, which comes from the Mandarin for “strange wing” and can be roughly butchered as “ee chee”. The name hints at this pigeon-sized animal’s most remarkable feature. Each of its hands had a long bony rod extending from the wrist. This rod seemed to support a membrane, much like that of a flying squirrel or bat. Yi was a dinosaur with bat-like wings! What an astonishing find! These wings were mutually exclusive: dinosaur or pterosaur, feathery or leathery. But Yi went for both options! It had membrane wings with a feathery covering on the leading edge. It shows that at least some dinosaurs had independently evolved the same kind of wings as pterosaurs—an extraordinary example of convergent evolution. There’s only one known fossil of Yi. A farmer in China’s Hebei Province found it around eight years ago., and the Shandong Tianyu Museum of Nature bought it shortly after. Xing Xu and Xioating Zheng from Linyi University, who discovered the creature, first laid eyes on it in 2009 and started working on it in 2013. “It looked special to me,” Xu recalls. As the team exposed and analysed the specimen, they worked out that it was a scansoriopterygid—a group of small, feathered dinosaurs with very long third fingers. These species were reputedly good climbers (their name means “climbing wing”) but there was no evidence that their feathers were good enough for flight. The same applied to Yi—its feathers, covering its skull, neck and limbs, were stiff filaments that ended in paintbrush-like tips. They were very different to the flight-capable plumes of birds. But, as Corwin Sullivan from the Chinese Academy of Sciences realised, there is something comparable in flying squirrels. These rodents glide from tree to tree by expanding a membrane that stretches from their wrists to their ankles. They deploy this membrane by splaying their limbs and extending a long piece of cartilage (called the styliform process) that protrudes from their wrists. Bats have a similar piece of cartilage (the calcar) on their feet, and pterosaurs had a similar bone (the pteroid) on their arms. All of these structures do the same thing: they support a membrane that keeps their owner in the air. Yi’s wrist rod was almost certainly fulfilling the same role. “As far as i know, this is the only plausible interpretation,” says Xu. He even found several patches of what look like sheet-like membranes, surrounding the rods and fingers of both hands. Again, they’re unlike anything seen in other dinosaurs. But Yi “is not necessarily as weird as it might first seem, in an evolutionary sense,” says Michael Habib from the University of Southern California. 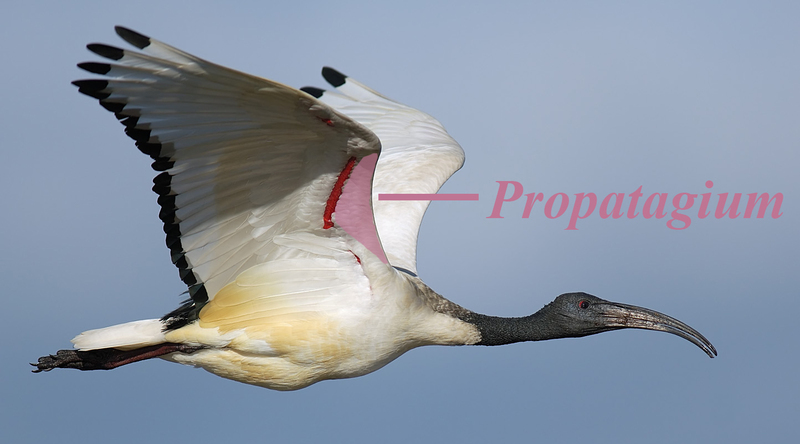 “Living birds actually have membranes around their forelimbs, including a well-developed membrane in front of the elbow called a propatagium. Feathers cover [these] parts of the wing, obscuring the soft tissues.” Yi simply extended these membranous parts with the help of their weird extra bone. For the moment, the team can’t work out how it held its wrist rods, and so can’t reconstruct the true shape or capabilities of the extended wing. This is crucial. A broad membrane, Habib says, would have kept Yi qi stable in the air, and allowed it to launch and land safely. With a narrower membrane, it would have needed to fly or flap very fast to stay airborne, and to take off at high speeds. For now, this discovery reminds us that the evolution of flight among birds and other dinosaurs was not a simple story. In the late Jurassic period, when Yi lived, there were all manner of dinosaurs with varying shapes, sizes, and numbers of wings. It was a world of not-quite-birds and just-about-birds—and now bat-winged dinosaurs, too! “What a grand age of experimentation!“ says Ksepka. “This may also be evidence that flight evolved multiple times within dinosaurs—perhaps three or more times,” adds Habib. PS: Here’s another odd thing about Yi. Its feathers preserve traces of melanosomes—small sacs of coloured pigments. That’s not unusual in itself; several scientists have used melanosomes to reconstruct the colours of fossil feathers. But Yi has some of the largest melanosomes ever seen. “I had to double-check to make sure I did not misread the measurements,” says Ksepka.